1) Login to phpMyAdmin and select Databases. 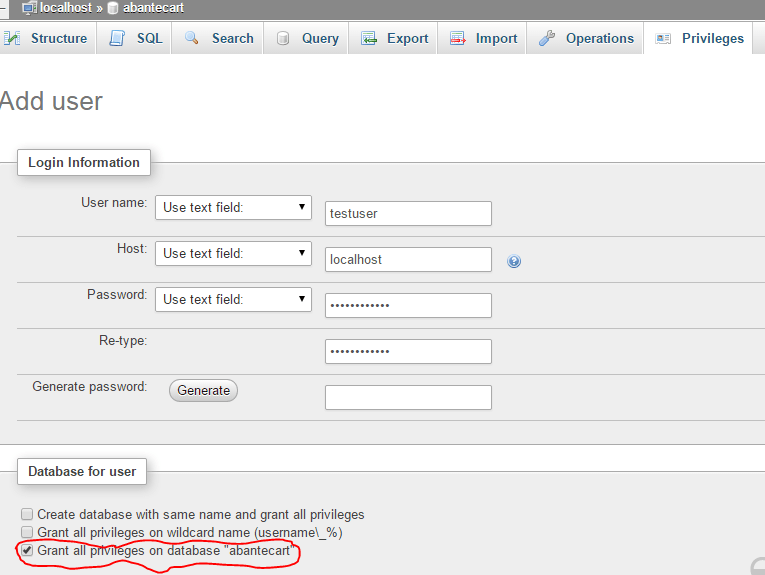 Under the Create database, give your database name abantecart and submit create button. At the middle you will see Grant all privileges on database “abantecart which means user “testuser” has full access on database “abantecart. 4) Submit go button at bottom right corner. Your will see the following screen if user is created successfully. Most of the CMS like WordPress, Joomla, Drupal and e-commerce like Magento, Abantecart etc. require creating a database and a user who have sole permission of that database. By phpMyAdmin you can do it within five minutes.